Dare to be Innocent! A super-girly site for lovers of innocence, elegance, purity and fun. Is Your Innocence Lost Forever? Magical Girls are For Real! 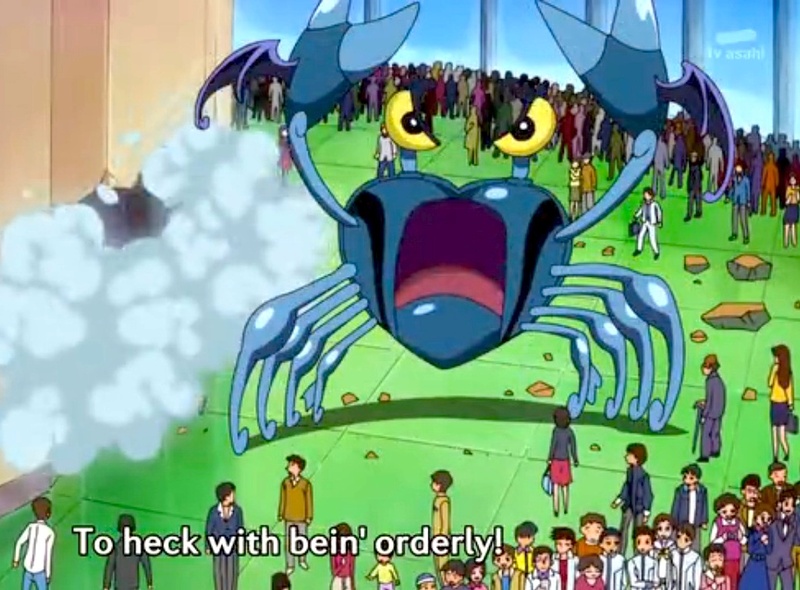 In DokiDoki Precure the primary enemy is selfishness, embodied in a monster called King Jikochu (King Selfish) and its humanoid minions, the Selfish. Each Precure series has a different enemy based on a different “theme”. Superficially these can be seen as so many arbitrary and colorful story elements, but if we look at them a little more closely we can see that there are in fact important connections between them. In Suite Precure, the enemy is “Noise”. The fundamental conflict is between harmony and discord. The harmony (and the discord) are expressed musically, but we should note that 和 wa or harmony is a fundamental concept in Japanese life and in traditional metaphysics in general (it is an interesting side-note that the most literal battle between harmony and discord in serious music is one of the very few that have gone to the side of the angels in recent West Tellurian history). Wa is both social harmony and the “music of the spheres” — the harmony of all being. When each spoke assays to be the center, the wheel cannot turn. 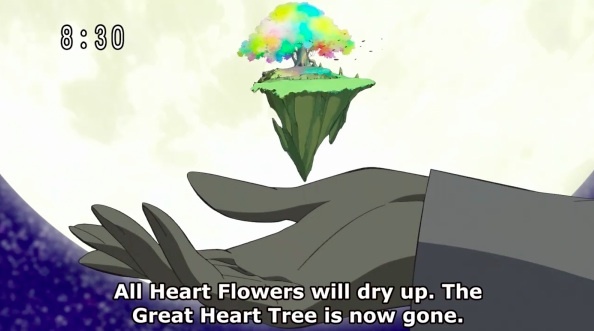 In Heartcatch Precure the enemies are the Desert Apostles whose aim is to cause the withering of the great Heart Tree by exploiting the weaknesses of people’s individual Heart Flowers. Each individual Heart Flower (everyone has one) is connected to the great Heart Tree, and the health of the Heart Flowers and the Heart Tree are interdependent. Perhaps we begin to see a pattern here! The connection of the individual with the Whole; the importance of wa or harmony; the enemies who seek to disrupt that harmony in the service of discord, selfishness, or a “bad end”. In Smile Precure the theme is fairy tales, which, as most of us know, carry fundamental truths at their heart. The Happy Ending is precisely the defeat of discord and the restoration of divine Harmony. The enemies seek 最悪の結末 saiaku no ketsumatsu — “the worst possible ending” for the world. They mock friendship, trust, and amity as things they “don’t need” and continually preach against them. Precure stories are always philosophical debates in this sense. A friend observed that a Magical Girl can rarely attack successfully without first stating the fundamental rightness of her cause. Very often in Precure battles the girls are at first defeated and the rallying point (while often depicted as a pretty new power) is actually heralded by a speech in which the wrongness of the villains’ cynical perspective and the rightness of amity and universal harmony is eloquently expounded. Often these speeches will center around everyday things — the happiness of a Japanese omatsuri (festival); the reading of fairy tales to small children; food prepared with love and dedication. To some viewers these things may seem trivial or “childish”. In fact they are the everyday ways in which we express and reinforce wa or harmony. That the villains sneer at these things while the heroines eloquently praise and defend them is a vital expression of the moral and metaphysical conflict that is taking place. That the villains’ point of view is often remarkably close to the cynicism popular in the current West is something most Japanese people are quite unaware of. They tend to believe that the West is a lot healthier than it actually is. Someone recently said that English has no word for wa because the culture has no wa. While the metaphysical equivalence of social and cosmic harmony to music is profound, it does show a lack in the language that there is only a musical analogy to represent the concept. A member of the Daughters of Shining Harmony once told me that it would have been impossible simply to use “Daughters of Harmony” because it would sound like a vocal quartet, and there really is no word in English to express wa/harmony. However that may be, the villains of the Precure series are fundamentally representatives of fuwa (anti-wa — or in terms of feminine spirituality, athamë) which is essentially discord: the chaos that precedes cosmos in Greek thought, the opposite of the Music of the Spheres, and the principle of disharmony between people, which manifests as the harmony-destroying selfishness. When each spoke assays to be the center, the wheel cannot turn. Ai wo nakushita kanashii kani-san kono kyua haato ga anata no dokidoki torimodoshite miseru! “Heartbeat” here is hard to translate. It is dokidoki , which can mean excitement or happiness but also refers to the heartbeat, and as I think must be clear by now, it refers equally to both these things at once — to the restoration of the True Heart as opposed to the isolated, fuwa, selfish heart. The heart has lost love by becoming selfish. Its self-seeking can only lead to unhappiness because it has left the dance of the Universal Music. The job of the Precure is to restore the true heartbeat, that is at once harmony, happiness, and abundant life, to both the individual and the cosmos. I have enjoyed playing video games for a long, long time. Sometimes almost too much, I am afraid. One of the interesting things I have learned is that most of the video games that I have liked over the years come from Japan. One of the games that I really like is Dragon Quest IX: Sentinels of the Starry Skies for the Nintendo DS. This games has a number of wonderful features for us here at Senshi. Aside from being an exciting adventure story game, it allows you to have an all girl team and to play dress up with one’s armor and equipment. The armor and equipment shows in game play, so there are times when one has to choose between fashion and good statistics, which is often a difficult choice! Among many interesting things in this game are subplots that form the basis for a large part of the beginning of the game. As part of the main plot, fyggs or fruits from a Celestrial Tree fall down below to the terrestrial plane. These fyggs purport to be able to grant the desires of people that eat the fygg, Yet, the granting of the desires turns out to be quite problematic. The fygg turns the person into a monster, that as the heroine, one must defeat. After the monster is defeated, we find that the original person was usually quite ordinary, with ordinary faults and failings. These made for quite interesting and often moving subplots to the game. Those of us who have been watching DokiDoki Precure will likely recognize this theme. The villains from the Selfish Kingdom “grant the wish” of their victims by turning their heart black, stealing their hearts, and using these dark hearts to create a monster that creates havoc until the Precures come to defeat the Selfishness and return the cleansed hearts to the victims. So, what is wrong with one’s wishes being granted? That is a good question, and I think that the answer is a bit complex. I think that one of the points in both the game and in DokiDoki Precure is that victims wishes are not really being granted. I think that maybe the best way to explain is that these are the wishes of their False Self, or the part that we all have inside that is not aligned with Good, like the popular Western motif of the little devil on our shoulder. Our True Self is that which is aligned with the little angel on our shoulder. As you recall, in DokiDoki, the victim often resists the urge that the villain eventually uses to steal their hearts. I think that there is an assumption in both Dragon Quest IX and in DokiDoki Precure, that most of us truly wish to be good, and that this wish trumps any self centered desires that we may have. As the Dragon Quest game proceeds into the larger story line, we find that the fyggs are actually…oh oops…spoilers. Well, I can say that the fyggs themselves are not evil either, and the wishes of the victims are not evil wishes, they were just corrupted. 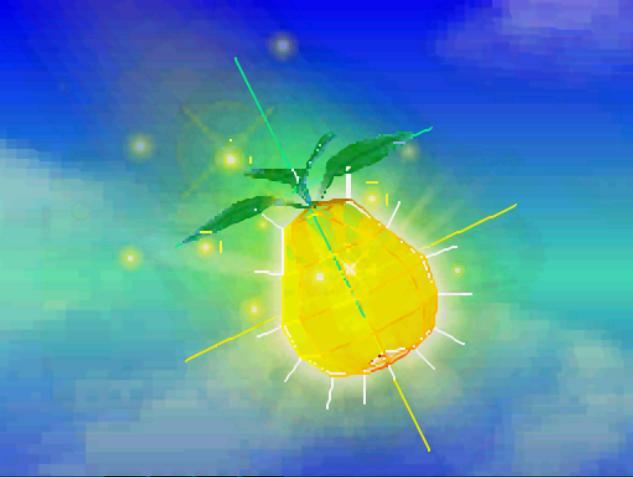 In fact, we find out later in the game that fyggs are actually fruits from the Divine in Her Daughter form. In the Dragon Quest game, after the victim of the corruption is purified, the energy from her wishes are also purified, and the entire town or village benefits. As I am writing, I am having a really hard time being able to put into words the difference between the corrupt wishes and the purified wishes. Even if I were to give spoilers and specifics, it would be hard. I think I am realizing that it is because these concepts do not translate well into English. I have started learning Japanese as well, but my studies have been cursory and quite basic, unlike the other authors of this site. I was taught a Japanese term that may explain this somewhat. There is a Japanese word wa that roughly translates to “harmony.” I say roughly because harmony in English mostly refers to music, but there is a deeper harmony of life, society, and the cosmos that is reflected in earthly music (or it should be). The term wa refers to this deeper harmony. The opposite of wa is fuwa, or disharmony. This may seem like an aside, but it really is not. I have noticed that I have not necessarily got as involved in DokiDoki Precure as the other authors of this site. I think I know the reason why. It is because I need to watch it with English subtitles. I have found that the DokiDoki dialogue seems rather strange and awkward in English. In talking with Cure Dolly, who watches DokiDoki Precure with Japanese subtitles, she has mentioned that she could imagine how difficult it would be for the translators. One of the things that she explained was about the Selfish Kingdom and the monsters, “Selfishnesses.” If I understand correctly, selfish is not really the precise term, but there is no equivalent in Japanese. From what I have been told, in Japanese culture, there is an expectation that people will think of the group and community first, and to do otherwise is considered quite rude. For example, it is my understanding that a statement that seems positive to a Western mind, “Do what you want to do,” is considered quite insulting in Japanese culture. The closest translation to this concept is selfish, from what I have been told. This takes me back to the premise of this article. I think that in DokiDoki Precure and in DragonQuest IX, it is not the wishes themselves that are problematic. We should have dreams and wishes. What is problematic is when these wishes only relate to one’s own personal well-being without considering the group or the society. When the wishes become fuwa, or they are granted in a way that is fuwa. This actually prevents the wishes from being realized in a way that is wa, or in harmony with the group, society, and with the Music of the Spheres. I have not finished the game DragonQuest IX, but it is getting quite interesting in a metaphysical sense as the story is progressing. DokiDoki Precure is also getting quite interesting. For example, it seems that Regina-san can turn people’s heart’s black without their specifically opening the door with “selfish” thoughts. I wonder how that is possible. So, I will leave these thoughts as they are at the moment, but there may be more as I get through the game, and as the DokiDoki Precure series progresses. Start here for the key concepts of this site. • Is Your Innocence Lost Forever? • Magical Girls are for Real!